- VERSATILE AND FEATURE RICH BACKPACK that is ideal for all skaters. Skaters will appreciate this bag for its compartments and ability to carry skates as well as fit in an overhead compartment when traveling. - INTERNAL SKATE HOLDER WITH WHEEL COVERS & wet pocket storage on bottom keep items cleaner. Helmet clip is located on top of bag and can be pulled against external side when not in use. - PLENTY OF STORAGE SPACE includes a padded notebook pocket, internal pockets, key ring, external front pocket, small top & two external pockets for water bottles to give the skater room for any skate expedition. 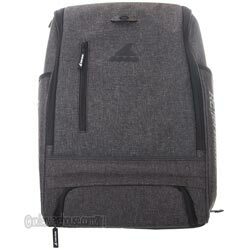 - PADDED SHOULDER STRAPS AND BACK provide cushioning so skating with the bag on is comfortable with more ventilation. - REFLECTIVE PIPING FOR SAFETY AND YKK zipper ensure quality closures and added safety for night skating.